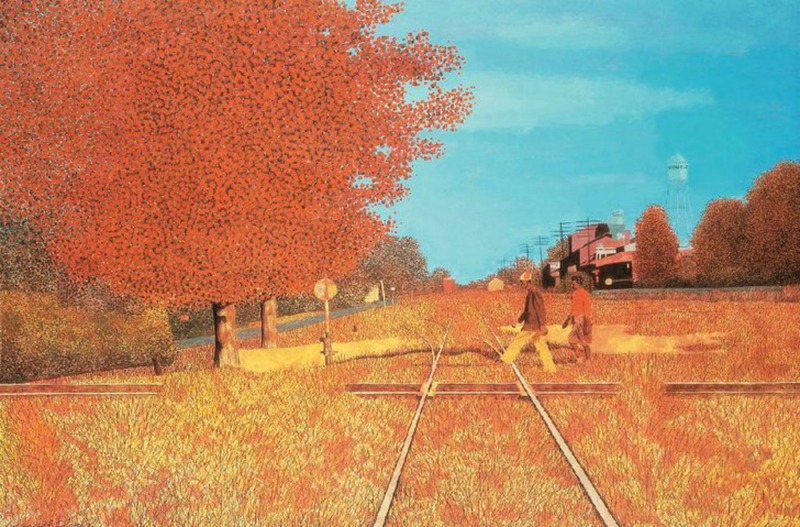 A reader has drawn our attention to a 1965 painting by Carroll Cloar entitled “Where The Southern Cross The Dog” which depicts a railway crossing in Moorhead, Mississippi. 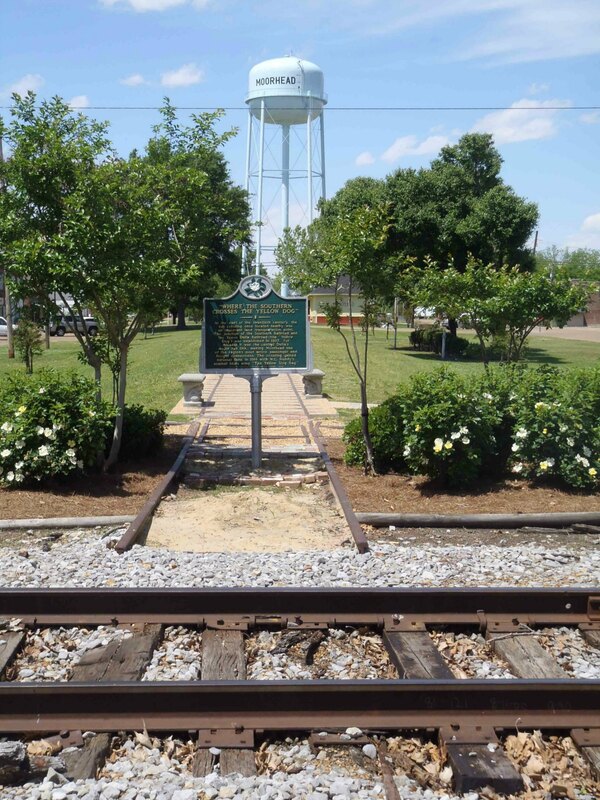 This railway crossing became part of the lyric in W.C. Handy‘s Yellow Dog Blues. Carroll Cloar painting “Where the Southern Crosses The Dog” in Ruleville, Mississippi. Our reader was wondering whether we knew where he could buy a print of this painting. We couldn’t find any available prints of this painting. If any of our readers know of any commercially available prints of this Carroll Cloar painting, please let us know via the dialog box below. We will pass the information along. Here is how the same scene in Moorhead, Mississippi appears today. The Mississippi Department of Archives & History marker “Where The Southern Crosses The Dog“, Moorhead, Mississippi, looking north. For more information about this location in Moorhead, Mississippi see our page Going Where The Southern Cross The Dog, Moorhead, Mississippi. John, we’ve had readers ask about this in the past. We have done some checking and we haven’t been able to find any commercially available prints of this Carroll Cloar painting of Moorhead. If you come across any, please let us know. You are not the only person who wants one. I just found a print of this painting in our basement. Does anyone know how much a print is worth? I’ve been told around $50 for this particular one. Would you be willing to sell it? Anybody with a copy of the Carroll Cloar print, do you want to contact Rhett Graves about selling it? For anyone with a copy of this Carroll Cloar print that they wish to sell, do we have your permission to give your email address to prospective purchasers like John Deardorff? I have a copy of this Carroll Cloar print, although it is somewhat faded due to a previous owner having displayed it in a sunny area. I took it out of its frame, as the frame was worn and outdated. I purchased the print at an estate sale out of Macon, Georgia some time ago. You may give interested purchasers my email address, and I can send them some photos if they are interested. Thank you! If anyone is interested in contacting Selina about purchasing her Carroll Cloar print, let us know and we will send you Selina’s email address. Please send me the contact information of any known sellers of Carroll Cloar’s “Where the Southern crosses the Dog” print. Just sent you an email with Selina’s email address. Please send me photos of your print. I am interested. This is for a 95 year old widow who used to sit by the crossing with her future husband when they were dating 75 years ago. We have a framed print of this that we would be interested in selling. Please contact us by email. Anyone interested in Sharon’s framed print can leave a reply here and we will send you her email address so you can contact her directly. We sent you an email with Sharon’s email so you can contact her directly.